The wooden desk organizer can hold your business cards, small items and smartphone. Need it to manage your desktop? Let’s go on checking the handmade gadget. This is a well-crafted and functional wood desk organizer that measures 3 x 10 x 1/2 inches, and handmade by sonofasailorSUPPLY from Texas. 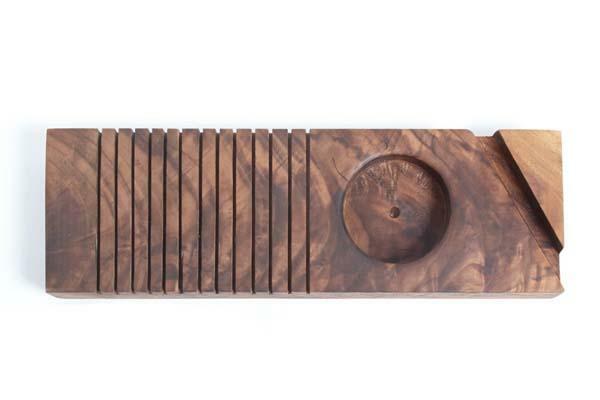 As shown in the images, the desk organizer features a simple and elegant design and it’s hand carved from a solid piece of figured walnut for durable construction and fashionable feeling. The desk organizer has an integrated phone stand that can hold your iPhone or similarly sized smartphone for comfortable viewing or charging, and a rounded holder keeps your coins, cufflinks, Lind and some small accessories in place. Apart from that, beautiful parallel lines prop your business cards and notes for ease access. 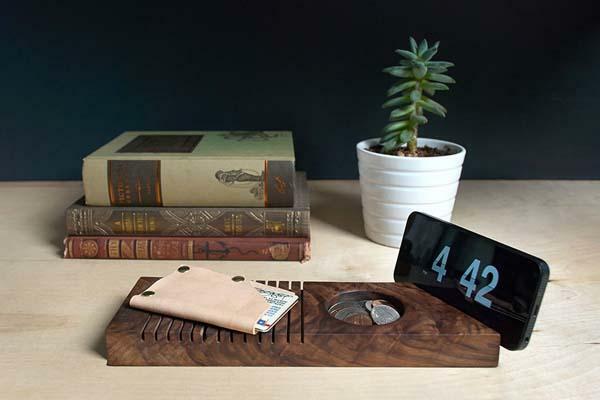 The handmade wooden desk organizer with phone stand is priced at $65 USD. If you’re interested, jump to Etsy (unavailable) for more details.